What do you think about tiny, elfish creatures flying carelessly in a magic forest? If they fit your mood and taste, please keep reading about Pixie Wings slot developed by Pragmatic Play. This cute and sparkling game comes with 5 reels and 50 paylines. The action keeps the high speed due to Stacked Symbols and 5 different Free Spins features. Prizes, on the other hand, deserve the title of the royal treatment. A place where our 4 blue-blooded characters live is some enchanted forest with breathtaking views. Images of pixies in their colourful outfits and with tiny wings are very nice. We can assume 2 male and 2 female creatures create the family of a king, a queen, a prince, and a princess. The good news all of them land stacked on the reels and bring nice prizes. A to 10 card icons are also in the paytable as well as 2 special symbols. Wild (Logo) and Bonus (Tree) icons hold the key to huge prizes and fun. How Do the Special Features Work? Despite the somewhat too-much-used theme of magical creatures and fantastic forests, Pixie Wings slot has the features every gambler would like to trigger. By the way, it is advisable to do this at checked casinos, such as Box24 casino instant play in order to experience the safe and rewarding gambling. So, the first peculiarity of Pixie Wings game is connected with a Mystery Stacked symbol. At the beginning of every main game spin, 1 of 4 Pixie icons is selected to act as the Stacked symbol. There is the chance you can spin the reels even with Wild Stacked symbols as the Logo icon can also act as the Mystery Stacked one. The second and the last special symbol is the Tree Bonus image. 3+ Bonus icons trigger the Free Spins feature. At the beginning of the feature, players face the dilemma of choosing among 5 various free spins options. The thing is each version has a different number of free spins and offers its own Stacked Symbol. The King Stacked icons go with 5 free spins while the Queen Stacked symbol is connected with 7 free spins. You may like 9 free spins with the Princess Stacked icons as well as 11 free spins with the Prince acting as the stacked symbol. The last option is the round of 3 to 12 free spins with the Logo or 1 of 4 character symbols acting as Super Stacked icons. 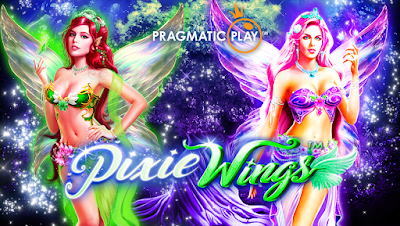 Our opinion, Pixie Wings is the lovely slot with the nice design and the set of cool features. Super Stacked symbols are the great addition as well as 5 free spins options. Enjoy yourself and grab nice prizes.